Hyperconnectivity is a megatrend whereby everyone and everything that can benefit from being connected to the network will be connected. What are the enterprise opportunities and challenges of hyperconnectivity? 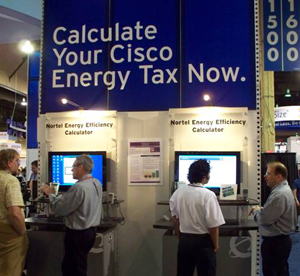 Ever since Interop, there’s been a lot of buzz in the industry about the Cisco Energy Tax. The answer lies in how Cisco has architected their products, driven by their network-centric strategy built on IOS. IOS has evolved into a Swiss army knife of functionality, with literally hundreds of features that most enterprises have little use for (I discussed this ‘Feature Creep’ in an earlier posting). Anyone still running DECnet or IPX in their networks? To deliver on this strategy, Cisco tends to develop their own custom silicon (processors) in many/most of their product designs, with apparently little consideration of energy efficiency. In contrast, Nortel chooses to leverage off the shelf merchant silicon, without sacrificing features or performance. Merchant silicon not only has a smaller energy footprint, but is also on an accelerated price/performance curve. There is no quick fix to Cisco’s energy woes. Expect Cisco to rev up their marketing machine, with their CEO telepresenting how energy efficient Cisco is (or would like to be!) on every occasion. . But there is a better way for customers. Instead of waiting for Cisco to re-architect their products and deliver this to you as a rip-and-replace solution, you can pay 50% less on your energy bill for 2-3 years, AND get better performance and reliability.